•The Laurent Ferrier Research and Development (R&D) department has created a new geometry for the lever and the escape-wheel intended to optimise the efficiency of the system. This design, along with the use of steel, further increases the performance of the Swiss lever escapement. The new shape of the lever (patent pending) stems from a reflection on how to improve the position of the two pallets in an optimal manner so as to reduce the security angles in the escapement construction – the goal being to increase the impulse surfaces and thus intensify the system’s efficiency. In terms of automobile imagery, Laurent Ferrier has sought to improve the efficiency of the engine in order to cover a maximum distance with a minimum amount of fuel. This new geometry provides constant support for the lever and serves to achieve optimal values in each position. It reduces the losses of force due to backlash and facilitates the unlocking impulse. Instead of increasing the forces in play in the barrel, Laurent Ferrier pursues its efforts in the same spirit of using existing energy in a more effective way. •The famous head-to-tail mounted double balance-spring system has been revisited in a new and more resistant material that will remain confidential and is designed to further enhance regularity. 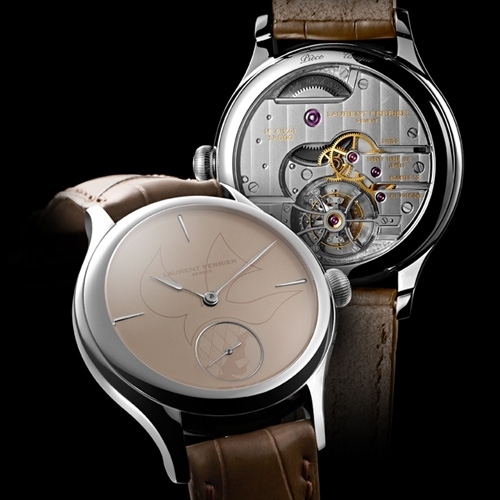 •The balance – now exclusive to Laurent Ferrier – has been redesigned in order to perfect its rating precision. The four adjustment screws are in gold to ensure the finest possible adjustment.